Modern, detached villa with private heatable pool. You can access the pool via one of the two fenced terraces. 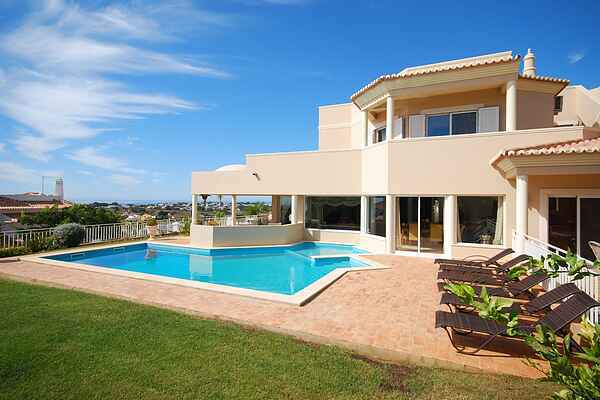 You have views over the hilly surroundings, Albufeira and the ocean. To make things complete, there's also a lovely lawn where the kids can romp to their heart's content. Albufeira is just 3 km away. This is a charming seaside resort with many shops, restaurants, outdoor cafés and bars. The old town has buildings from times long gone by in narrow streets and on lovely squares. The city beach is just 3.5 km aways, but there are many beaches to choose from. There are numerous hidden bays all along the beautiful coast. Great for taking a spin in the car to visit a couple of them. The idyllic bays Praia de São Rafael and Coelha, for example (both 5 km). You can of course pick one and stay there all day. To really get to know this part of Algarve, you have to get away from the coast at least once. A nice car ride will bring you to picturesque villages Paderne (20 km) and Alte (30 km). Both villages lie at a hill and it feels as if time itself as stopped.